… all while keeping the overall trend in the view. 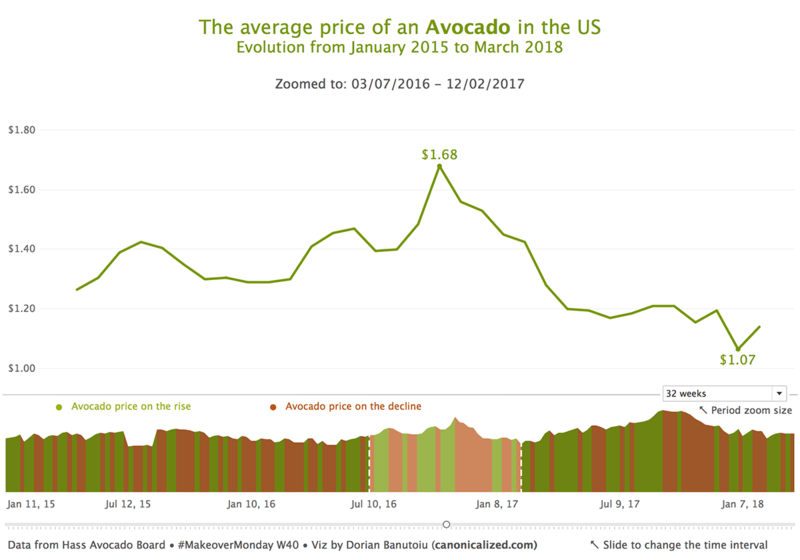 The chart shows the average price of an avocado in the US by week (data source). 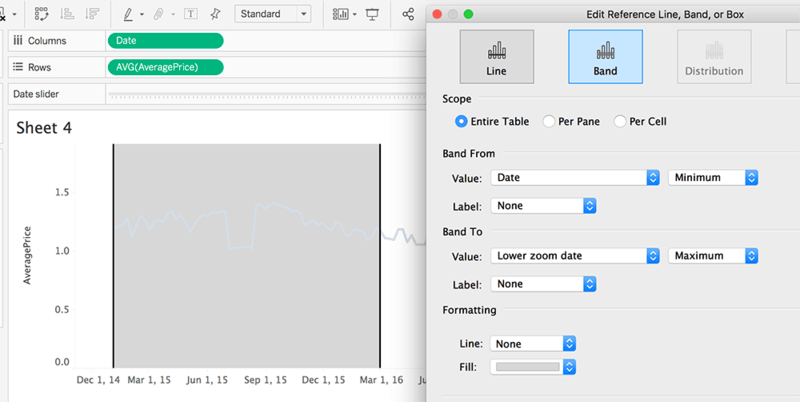 The line at the top shows the same data as below, only “zoomed” to a predefined period. I think it’s a pretty useful way of looking at longer-than-usual time series. I am going to show a few different ways to do it; starting with the easiest method, and going up to the most complex one. To obtain the highlight effect, we will be using two reference bands. Before adding them to the view, we should create a parameter for the slider functionality. We will be using it to move the highlight across the line chart. The slider looks nice, but at this point, it doesn’t do anything. To give it functionality, we need two create two date calculations. Now you might be wondering why [Zoom to (in days)] is here for. I am using it to control the size of the zoom. It’s a calculated field based on a parameter. You can hardcode the period you want to zoom in, but I chose to leave the option open for my audience. So, for the lower end of the highlight, I am subtracting half of the zoom interval from the date where the slider is positioned. Similarly, for the upper one, I am adding half of the time interval. Now that we have our calculations, it’s time to add the reference bands. First, we should drag a reference band on the date field. 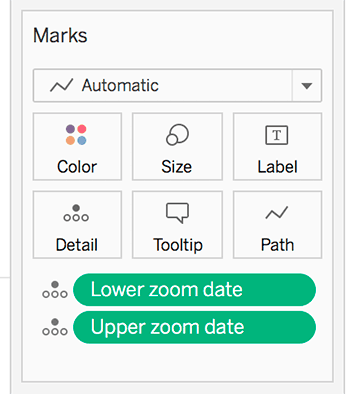 The date field should be continuous (green pill) for this to work. We could have used a single reference band to highlight the middle-part only, but I liked it better this way. Now we have a cute highlight, but there’s not much we can do with it. By adding a new sheet with just the highlighted part, we are in business. We have the basic functionality, but some of us might want to make it look a bit better. First, let’s get rid of the zero from the axis. It will give us a better picture of the variation from one week to another. I think it works well since we already have everything in the chart beneath it. 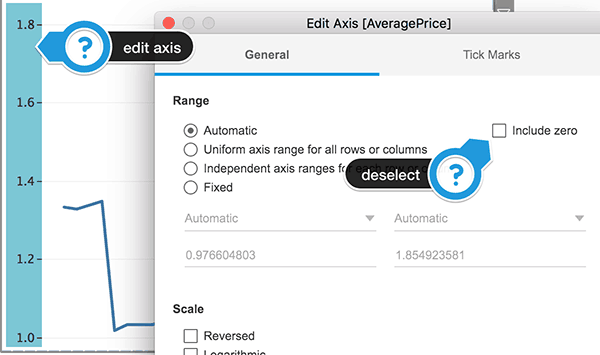 So, right click on axis > “Edit Axis” > deselect “Include zero” option. At this point, we’re facing a little dilemma. While moving the slider left, and right, the zoomed line’s axis is always changing. It could make it a bit hard to follow. My solution was to add an empty reference band ranging from the all-time minimum to the all-time maximum. You could instead fix the axis range, but I wanted to make it as flexible as possible. At this point, we could call it a day and consider our work done. For those of you who enjoy making your lives harder, we will take this a bit further. We can add colors to highlight the weeks when the prices increased/decreased. Right now we have just a colorful band; we need the price trend in the view. Which is not really what we’re after. We want the bars to show up below the trend. The only way I could think of to make this work was to fix the area’s Y axis on 2 and subtract 2 from the average price value. 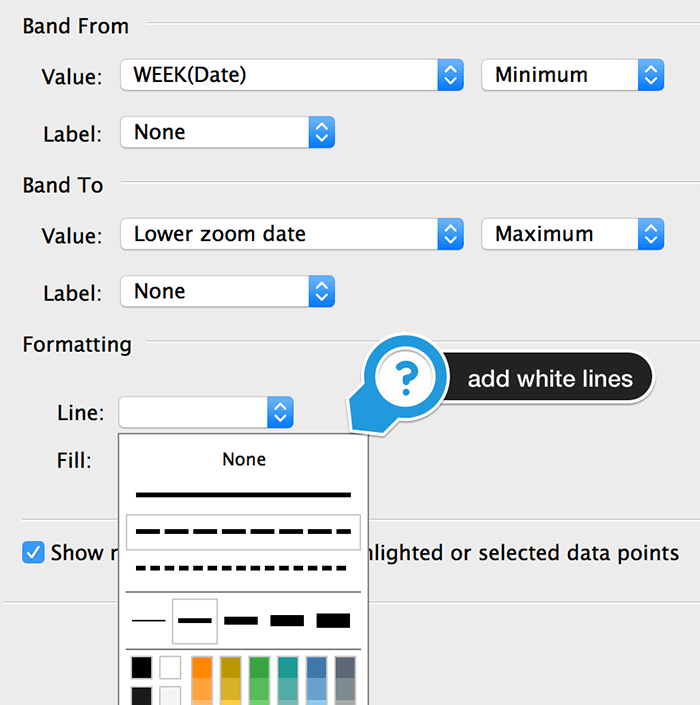 Now I realize that if new data comes in with values out of the [0-2] boundaries, the chart will get messed up. If you have any idea for a better way to deal with this, please share it! For now, we have to deal with one more thing: lining up the decrease/increase colors precisely below the line it corresponds to. If you pay close attention to the graph, you will notice that the colors are with one date ahead of the line. If you can’t see the difference, there’s no point reading further! Just kidding! We can only move forward here! 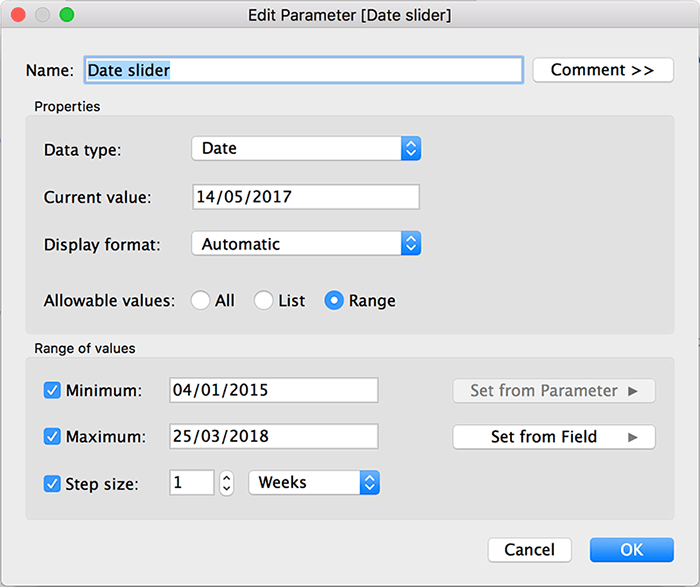 Useful in cases where new data comes in, and our parameter doesn’t adapt (we don’t have dynamic parameters in Tableau at the moment). You might have to duplicate the data (union onto itself) to make it work. Here’s some inspiration from Rody Zakovich of how he used polygons to shade between two lines. Also, Ken Flerlage’s Joy Plot template is an excellent place to start. You can download the workbook from my Tableau Public profile and work from there. Hit me up in the comments if you have questions or if you want to show off your work!